Nobody is going to accuse Warren Brown of being lazy. The owner of DC-based CakeLove and its related cafes, he is a darling with the press and even filmed a show with the Food Network for a while. And the attention is warranted: their baked goods are buttery, creamy and comforting just like good dessert needs to be! While the cupcakes and cakes are the stars of the show, Cakespy was most impressed by yet another pastry whose name mortifies us: The Buzz Ball. So what is a Buzz Ball? No, it does not involve drunken frat boys finding an electric razor and hilarity ensuing. 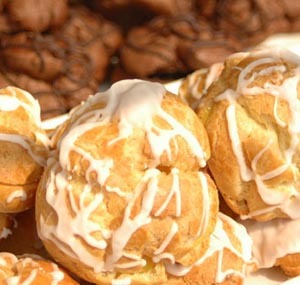 Buzz Balls are cream puff-esque pastries, filled with rich creams in flavors like coffee, chocolate, mango and lemon. Apparently the name is a derivation based on taste and appearance--coffee was the first cream flavor offered, lending the "buzz"; once the cream was injected into the dough it made it round, like a ball. Either way, the light-as-air dumplings filled with rich cream and drizzled with sugar icing have completely won us over, even if we're not convinced that the name is as innocent as they say. Unfortunately they can't be shipped at this time, so if you want to taste the coveted Buzz Balls you're going to have to visit one of the DC-area locations (check out locations online at cakelove.com); however, CakeLove does have a "Box-O-Luv" series of pastry samplers which can be shipped; visit here to see the options.